The coup d,etat regime must resign immediately! Tody in beheshte Zahra cemetery the 40th day of martyrs! the coup d,etat regime is going to collaps soon! This is from today .Iranian people are determined on their demand that Musavi is their president . Today is the 40th day of the martyrs in Iran! As i promised ,here is the horrendous crime happening in Iran right now! I have seen this video. I wanted to say this video clip is the most horrible crime against young Iranian i have seen so far. Some people drop young people from the bridge down to the street while their hands are tied and other militia take them away from the street below. Open this and watch the horrible crime against the young Iranian peaceful protesters. I coud not copy the video, i'll try to make this video clip available later. 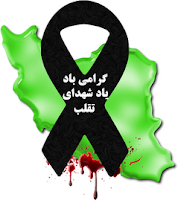 It is important that people of the world to see this crime against humanity by Ahmadinejad Government. July 25th universal day of action against the election cheating and coup d,etat regime of Khamenei-Ahmadinejad and for human rights in Iran! We must stand united and continue our united action if Ahmadinejad travels abroad , wherever he goes we go in front of their embassy or we stand srrongly impeaching him and the host country for neglecting the human rights inside Iran ! July 25, Universal United Action for human rights in Iran and green petition ( "Ahmadinejad isn't our president")signed by people ! 44 days after first protest the Iranian people continue their protest . "Here they chant: Death to dictator"
Protest continue : "Political prisoners must be released"
Two Iranian Airplane on different route , one from Tehran to Mashhad city crashed and according to news 33 passenger including some crew member and one board member of Aria Air by the name of Mr. Dadpay died in the crash and in the other accident the plane was on route from Orumieh to Tehran. In this accident the plane because of technical problem exited the runway and landed in the field. This is the assembly of expert!? Ahmad Khatami one of coup d'etat regime propaganda voice in Friday prayer . He said : everybody under the approval of Khamenei has the legitemacy even the president. People of the world in solidarity can join Iranian people around the world on July 25th for a day of action for human rights in Iran! Canadian in solidarity with Iranian people can attend a day of action organized by " solidarity with Iran committee" on July 25th at Queens Park-College St. at 11:00am to 2:00pm . In order to make the protest a unique one as in the green movement in Iran, you can wear a green T-shirt, green hat , green wrist band or bring a green baloon. People are preparing themselves for the 40th day of Neda's martyrdom on July 30th ! On the 40th day of "Neda's" martyrdom (30th of July ) people will join with her family at her grave side in "Beheshte Zahra"at noon time and then in the evening people will continue to lay flower and light a candle on the location where Neda was shot and killed. In this event the families of all martyrs will join Neda's family. "Just before Neda was shot , she was in touch with us, a short time after the last call Neda's professor called us and said , Neda was shot on the leg and was transfered to Shariati hospital, we arrived at the hospital as fast as we could and we saw Neda's music professor with blood all over his cloths , then they said she was shot on her shoulder, and gradually they told us that she died before arriving at the hospital.In the hospital the doctors asked us to allow them to take bone marrow from Neda's bone for transplant on others and we agreed.But the killing of Neda was reported evrywhere but we kept quiet in order to get her dead body and to bury her, On the morning of Sunday in "Beheshte Zahra" cemetery they gave her dead body to us. All the time the police and agents were on the go and were behaved and were searching to find Neda's killer and because of that they started searching and interrogating family members and many of family friends,for us it wasn't important and we wanted to do things according to the situation." Musavi's call for broader national front! Musavi is calling for a broader national front. 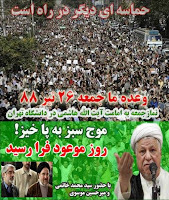 Hashemi Rafsanjani in his last Friday pray supported the green movement and weakened the coup d, etat regime of khamenei-Ahmadinejad. Khamenei in response warned him and others indirectly. Meanwhile Ayatollah Dastgheib supported Rafsanjani,s speech in last Friday pray and former president Khatami and few other personalities proposed for a refrendum in order to get out of the current political crisis. 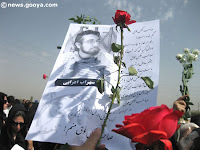 Below -pictures from a meeting in Germany commemorating Sohrab a martyr of the recent protest. Warning! the lives of thousands of Iranian inside the prison is in great danger! The lives of thousands of Iranian inside and outside the prison is in great danger. The situation in Iran is very volatile and it seems the regime of coup d,etat is preparing for total martial law . In this situation Musavi , Khatami, Karubi and even Rafsanjani is going to be arrested and god knows what will happen next.I feel the smel of blood. From now the "green movement for change" must organize and prepare itself for difficult time and feed the people and hold them in the streets. the history teaches us that only an organized and broad movement with support of people can win the fight. This is the time the oil workers together with bus transit workers and others must prepare themselves for a full blown strike. Another Martyr buried here,his name:Yousef Saleh. He has been killed by the militia of the coup d,etat regime. For the record .Regime militia and plain cloths shooting at people ! Three days hunger strike in front of UN in New York July 22-24! Akbar Ganji the renouwned Iranian journalist and writer organized a three day hunger strike in front of UN headquarter in New York in support of Iranian protesters for change and the release of political prisoners. Upto now many Iranian as well as internationalpersonalities have released statement either joining or supporting the hunger strike which is going to take place from July 22-24.
have been killed and hundreds of innocent people have been imprisoned. I'm in Europe and following the news . Things are changing for the benefit of the change in Iran.Tomorrow i'll post some of the news. 17th of July -"Friday pray" event, took place in and around Tehran University-People in mass showed up,protestd against the regime of coup d,etat. Who wana be in such a hated government cabinet? According to "ISNA" news agency Mr. Gholamreza Aghazadeh the head of Atomic Energy and vice president of the coup d,etat regime has resigned from his post 20 days ago but confirmed when ISNA 's reporter talked to him . According to news he presented his resignation to Ahmadinejad 20 days ago. Rafsanjani, Onward for reform and change or Backward for oppression, which way? Regime is extremely afraid of tomorrow's Friday pray. Hashemi Rafsanjani is going to read the prayer. still not clear which side he will take. I mean strongly taking side . He isn't going to take side with Ahmadinejad coup d,etat government for sure, but he may take center point and try to calm the people and call them to stay behind Khamenei. But his childrens and his wife would not bend to Khamenei-Ahmadinejad coup d,etat regime. If Hashemi take side with khamenei or ask people to bend to the regime , he will loose once for all the support of Iranian people who may tell him enough of these nonsence and enough is enough and without knowing he may be the victim of the coup d,etat regime. The news indicate that Musavi and Khatami are going to attend the prayer tomorrow. Young Iranian girle and boy are busy organising the mass attendance of people in tomorrow's prayer. They have also prepared slogans. the world media's ears and eyes are focused on tomorrows prayer. Iran's politics politicizing the world particularly the Middle East if allowed to be monitored or reported regularly by major media like CNN. Iran green civil rights movement! On july 25th Iranian all over the world will have a united day of action for human rights in Iran. In Canada the united day of action for human rights will take place on July 25th at 11 am-2 pm in College-Queens Park and University Avenue . Sohrab Arabi and his peace activist mom. Iranian pilots and stewardess for their own safety must plan the strike! Two days ago the chief of Airline organization was removed from his post and a coup d,etat element was apointed to the post! Three -four nights ago in a coffee shop i was talking with two of my journalist friends in exile and one spoke about news that the coup d,etat regime has changed the chief of the "Organization of Airline ". According to news Mr. khanlary who was a pilot was removed from his post and Mr. Ilkhani who crossed the security process in a fast pace was appointed as the chief!Why at this time ? No body knew. Today, two days after an airplain crashed and all its passenger died including the young national Judo team , they were traveling to Armania for friendly games. Many Armanian passengers including Armanian MP is among the dead . In total 168 Iranian people burned to death. This isn't the first time, in the past just a few days before student movement day, a plane with many journalists crashed and all died . Now, the question is why at this time? Just two days before an important event of Friday pray. Is regime planning to carry the coffins on Friday and bury them on this coming Friday? This regime can't be trusted at all. Under this regime everything is possible. The members and think tank of this regime are all from security and information elements of the Islamic regime. They all have secretive tie with suspicious elements. This coup d,etat regime is a good scenario writer and director , but the people of Iran dont buy it?They know the real face of this regime. From the mysterious/secretive appointment to the suspicious crash ! President Musavi and wife attended at "Sohrab's" home and mom spoke about son,who left home just with green cloth! She spoke: people must unite! 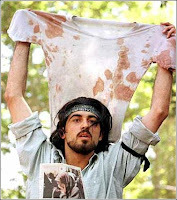 19 years old Sohrab Arabi was killed in Evin prison and his dead body was given to his peace activist mom 26 days later( member of mom's for peace) ! Musavi together with wife Ms. Rahnavard attended at the house of "Sohrab " one of the martyr.People are encouraged for Musavi joining the people. Why UN must send representative to Iran immediately? Musavi and wife attended tonight at the house of Sohrab Arabi 19 ,one of the young martyr of the recent protest. What has happened to Sohrab ? if he was gunned down during protest , why his body wasn't transfered or carried by people to hospital? and why there were no news and record about him in the hospitals? There are speculation that ; sohrab like many others were arrested and brought to Evin prison and there he was shot to death. Now, how many other detainees have been shot to death? According to news , many families are looking for their loved one, who have not return home yet . Is that true , they have been murdered inside Evin prison? how many have been murdered? why the regime is silent and not talking about the killings? And giving the bodies one by one to the victims families? Hashemi Rafsanjani is the prayer cleric on this coming Friday and there are talks that Musavi -Karubi and Khatami together with their supporters will join the prayer. This is a last chance for Rafsanjani to take side with people instead of mediating peace among Khamenei-Ahmadinejad alliance with reformist -change moderate Musavi -Karubi. Sohrab had something to say! Protest is definitely going to continue. Regime is scared of " Mass protest " and general strike! Sohrab Arabi was just 19 years old, he had just finished grade 12 and was ready for university enterance examination.He joined the protest and was killed . According to her mom ; he had a gunshot wound in his heart.His dead body was given to his mom after 26 days. 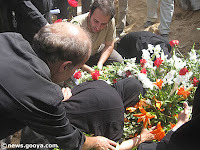 Sohrab's mom searching for her son in Evin prison befor regime's officials giving her the dead body of her son! Sohrab Arabi's dead body was given to his parents. Sohrab was only 19 years old! Today Kurdistan province had its strike. On July 9th, in unison with the people of Iran , more then two thousand Iranians in the Toronto area formed a long human chain on Yonge Street . The chain stretched from Willowdale’s Mel Lastman Square northward , approaching Finch Ave. 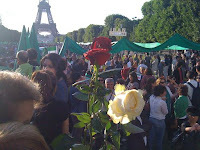 The event was organized by the Committee for Solidarity with Iran . Similar to Willowdale, hundreds of Iranians gathered along Yonge Street in Richmond Hill, carring placards and lighting candles. The placards carried by protestors aimed to raise the awareness of non-Iranians about the situation in Iran . They condemned the Iranian government’s suppression, brutalization, and jailing of peaceful protesters in Iran , who have repeatedly taken to the streets in large numbers since the controversial presidential election of June 12th. After sunset, hundreds of the demonstrators lit candles and remembered the dozens of victims of the recent violence in Iran . 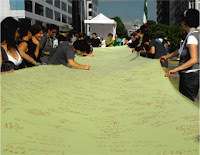 The organizers had also prepared a one-meter wide and ten-meter-long green cloth, which was signed by hundreds of protestors with the words, “Ahmadinejad’s is not my president.” More signatures will be gathered to voice people’s protests over the coming days. The numerous signed cloths will be sown together to create one of the world’s the longest protest symbols. 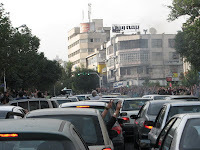 You be the judge, see how the Basiji militia attack on a car ! People see and the anger grow and grow from this coup d,etat regime! Iran won't be the same again!Khamenei-Ahmadinejad coup d,etat regime is playing with fire.This is on july 9 ,28 days after the first protest! On Sunday, June 21, Maziar Bahari, a Canadian-Iranian journalist and filmmaker working in Tehran, was taken into custody by men believed to be Iranian security officials. He was arrested at 7:00 a.m. at the apartment he shares with his mother. A laptop and several videotapes were seized from the apartment.On June 30, Fars News agency posted an 11-page "confession" by Bahari, in which he is reported to have said, according to a translation on The Washington Post's web site: "The activities of Western journalists in news gathering and spying and gathering intelligence are undeniable." The document also claims Bahari said: "I, too, as a journalist and a member of this great Western capitalism machine, either blindly or on purpose, participated in projecting doubts and promoting a color revolution. "Newsweek magazine, for which Bahari has worked as a correspondent since 1998, has called for his immediate release. So has Canadian Journalists for Free Expression, in a letter to the Iranian embassy in Ottawa calling on the government of Iran to immediately and unconditionally release all journalists and bloggers who have been detained simply because they are exercising their right to free expression.The Canadian government has done the same. Prime Minister Stephen Harper issued a statement on June 22, calling on the Iranian government to "release all political prisoners and journalists – including Canadians – who have been unjustly detained. "In a statement issued June 30, the Committee to Protect Journalists called on Iran to release all jailed journalists and stop vilifying the foreign press.Bahari is originally from Iran, but was educated at Concordia University in Montreal and maintains a home in Toronto. He is a Canadian citizen.His detention is only one incident among many in the unrest following the recent Iranian election. Among those affecting the media, the CBC reports, a BBC correspondent has been expelled and the Dubai-based network Al-Arabiya has had its rights in the country suspended. Some reports say as many as 34 journalists and bloggers may have been detained.On June 23 the entire 25-person staff of Kalemeh Sabz, a newspaper owned by opposition presidential candidate Mir Hossein Moussavi, were arrested. Most have since been released. That information is included in the regular updates that Reporters Without Borders has posted on its web site on the arrest and in some cases release of journalists in Iran.The detention and mistreatment of journalists in Iran predates the recent election. 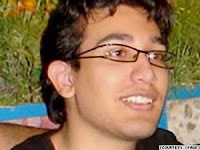 Blogger Hossein Derakhshan, also a Canadian, has been detained without charge since November 2008. Zahra Kazemi, a Canadian-Iranian photojournalist, died in Iran’s Evin Prison in 2003 after being arrested in connection with pictures she took during a student protest.An article by Bahari published in the New Statesman in November 2007 recounts his experiences as a journalist working in Iran. Click on the picture and look at it hundreds of time!!!??? Where is she? Story to be told about freedom in Iran! Happened in the past -World in support of Iranian green movement- Isn't it amazing? Here U2 grants its support! click on the picture and see it better! despite of martial law regime, the people continue to fight! proud to be Iranian ! Protest against election coup d,etat in its 28 days since June 13 ! It seems that nothing can stop this people now! 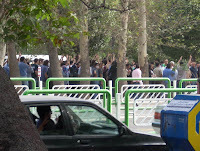 Iranian brave women and men continue their protest - Time to reinforce and make general strike a possibility ! Happened yesterday in Tehran but different location- protest under martial law government and NO international and local media presence! Thursday is a day of action of all Iranian inside and outside Iran against coup d,etat regime! Tomorrow all over Iran and Iranian all over the world are going to protest against the Government of Coup d,etat (Khamenei-Ahmadinejad regime). Ahmadinejad's martial law Government is in deep political crisis. the martial law regime is arresting peaceful Iranian journalists , writers, reformists, human rights activist/advocates in mass ,in short the regime has lost control and day after day facing with more crisis. People all over the world can join Iranian people in their demonstration in solidarity for change and freedom ! 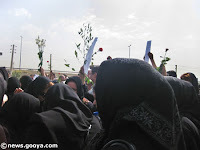 Family's of recent arrested political prisoners in front of Evin prison.one woman says: Tell them to hear our call for " God is greatest"
Join us on Thursday July 9th (18 of Tir) at 8-10 pm, to commemorate the 10th anniversary of the student movement and uprising in Iran. We will gather to form a human chain, one chain in North York and another in Richmond Hill. Join us and help to create public awareness and show your solidarity with the students of Iran. We aim to hold this event in a dignified manner so that we may show to our fellow Canadians the rich culture, prestige and the good name of our Iranian community. A. In Willowdale: Yonge Street, Between Mel Lastman Square and Steeles Ave.
2. The Toronto Police are kindly helping us with this event, please cooperate fully with the police and the organizers so that this event can be carried through in a harmonious fashion and display our community’s well earned name. 3. In response to numerous noise complaints from residents of these neighborhoods, please refrain from honking your horns and tell your friends and family to refrain from honking. Instead, to show solidarity, we are asking all participants to display the victory sign (the “V” sign with two fingers of one hand) through their car windows. 4. To ensure that local residents are not inconvenienced, please refrain from blocking drive ways, plaza entrances, building entrances and traffic lights. 5. To show your support for the victims of the violence in Iran, please bring a candle. Candles will be lit after dark. 6. Also, we kindly ask you to spread the word to your friends and family who are unable to attend; they can show their support by lighting a candle in their homes and placing it in front of their windows. "Martial law regime" of Khamenei-Ahmadinejd! 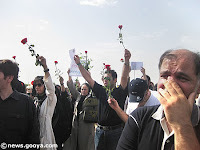 As we get closer to Thursday July 9 the 10th anniversary of " 18th of Tir" the students uprising in Iran, and as the news and talk is going on that on July 9, 2009 a mass protest will be going on at 5 location in Tehran and all over Iran , the coup d,etat regime of Khamenei-Ahmadinejad has imposed check points at different locations in Tehran. Just now 11:45 pm as i was passing "Satarkhan " street, the Basij militia and armed forces have made check point and if they see young people inside the cars they stop the cars. IRAN WATCH CANADA warns foreign nationals and dual citizen Iranian travelling in Iran will be dangerous! PARIS (AFP) — A French woman was detained in Iran last week on spying charges, France's foreign ministry said Monday, demanding her release. "France firmly condemns the July 1 arrest and detention by Iran of a French academic," the ministry said in a statement, without revealing the name of the woman or the university she was linked to. "The spying charges put forward by the Iranian authorities do not pass the test," the statement added. The woman had been in Iran for five months when she was arrested at the airport as she was about to leave the country, it said. "We call on the Iranian authorities to immediately release our compatriot and authorise her to leave Iran toward France," the ministry said. "France has informed its European partners about his subject and appeals for the solidarity of all Europeans." The announcement came as the 27-nation European Union mulls a response to Iran's arrest of local British embassy staff members in Tehran. All but one of the nine local employees have been released. Iran has accused them of instigating riots over the contested re-election of President Mahmoud Ahmadinejad. "blackout" a way to protest the coup d,etat regime of Khamenei-Ahmadinejad! In protest to election coup d,etat by Khamenei-Ahmadinejad tonight at 9:00pm (Iranian time)Iranian people will turn on their electrical equipement to overload the energy to bring blackout all over Tehran and other major cities( This may cause the government owned TV -Radio and prisons to have blackout too). This is the call of the day. The Committee to Protect Journaliststoday called on the Iranian authorities to immediately release all jailedjournalists and to stop vilifying the foreign press. CPJ also welcomed therelease of a number of employees of the reformist newspaper Kalameh Sabzwho had been held since June 23. In recent days, the Iranian government has launched a campaign designed tomalign the foreign press, blaming demonstrations that followed thecontested June 12 presidential elections on foreign news media,particularly British and U.S. news outlets. On June 19, Supreme LeaderAyatollah Ali Khamenei blamed foreign media for social unrest, calling it"evil" for allegedly misleading and agitating the Iranian people. Accordingto Iranian news reports, an official also claimed that the BBC, notgovernment gunmen, had shot Neda Agha Soltan, the demonstrator whose deathwas caught on camera and broadcast across the world, purportedly to agitatethe people of Iran against the government. * In this election a great and deep things happened and if the people become silent or not to protest this does not change anything and i think this protest movement will continue, in this election the problems of this system showed itself. * the slogan of "Every citizen a headquarter". The people have done this slogan very well , they helped and informed each other.At present there is no headquarter, but everyone has duty to inform others and must do this task very well. *When a government can't form legally , in peoples mind it doesn't have legitimacy and this problem will make the government weak and even it will drive it to violence against people. At present , the problem of this government is the political legitimacy and because of that the government face with serious internal and external problem. * We say this Government is not legitimate because it dosen't have the vote of the people. Happening in Toronto and all over the world simultaneousely in support and solidarity with the event in Iran. On Thursday July 9th (18th of Tir in the Iranian calendar), [INSERT TIME] to commemorate the 10th anniversary of the student uprising in Iran, we will gather to form long human chains in Willowdale and Richmond Hill. We aim to hold this event in a dignified way that befits the rich culture, high prestige, and good name of our community. A. In Willowdale: On Yonge Street, Between Mel Lastman Square and Steeles Ave.
-2. Showing our respect and full cooperation to the police, and working with the organizers in a harmonious fashion, we will display our community’s maturity. -3. In response to numerous recent noise complaints from residents of these neighbourhoods, please refrain from honking and instead display the victory sign (the “V” sign with two fingers of one hand) through the window. Longest petition signing by Iranian: "Ahmadinejad is not our president"! Begining of the longest petition signing in the history of the world. This initiontion was first introduced on Saturday July 4,2009 during the protest of 2500 Iranian in front of the Union of European council. during this protest hundreds have put their signature on a green banner which was written : "Ahmadinejad is not our president!" 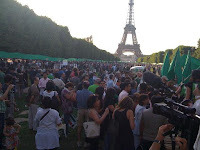 Same action is taking place in many other countries around the world by Iranian and at the end all these banners will be stitched together and one will be hanged in Eiffle Tower in Paris and the other one in CN Tower in Toronto, Canada. Isa Saharkhiz is arrested ! Isa Saharkhiz a well known Iranian journalist and member of the" Association defending media freedom" is arrested. It has been said that he was arrested in the morning of Friday July 3,2009. The EU countries must continue protesting against the coup d, etat regime of Khamenei - Ahmadinejad for imposing martial law and oppression against the free willing people of Iran and not recognizing this regime . I may be wrong but It seems that; the EU's only concern is just the release of the Iranian employees of the British embassy and not the election rigging in Iran , oppression and the killing of many or wounding and arresting thousands of people who wanted to bring change in Iran. History won't forgive you if at this crucial time leave the people of Iran alone and embrace the regime of coup d,etat. Read what Chris de burgh said on recent event in Iran! Recent events in Iran have filled me with shock and mounting horror, and I send my heartfelt sympathies and support to all my friends and fans there who may have been caught up in what has become a huge international story. Many people all over the world have reacted with anger and dismay at what appears to be blatant violations of basic human rights to freedom, health and happiness, and I sincerely hope that there will be a proper and fair resolution to these serious and opposing points of view, in this country with such a rich and important history, and a place that I have come to regard with respect and affection. Mourning the recent martyrs of " where is my vote ?" in Tehran! 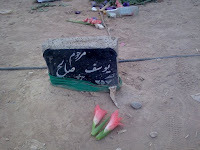 These are the tombs of the martyrs in recent peaceful protest in Iran in "Beheshte Zahra" cemetery . These young men and women were protesting about " where is my vote", But the coup d,etat government decided to silence them . 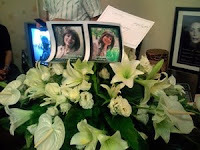 Please continue reporting about Iran - dont stop now - crime against humanity is happening now! CNN and other American or European news media must continue their reporting about Iran at this crucial juncture of the history of Iran. A big crime against humanity is happening right now in Iran by Khamenei -Ahmadinejad and it is our moral and humane duty to report about all these injustices in Iran.The coup d,etat regime is continuing arresting and detaining the reform/change personalities from all over Iran, particularly the members of " Mosharekat" party. Reports from Iran are disturbing,the regime is not responding to any question on the prisoners whereabout? International Human Rights organization , UN, NGO's and democratic Government must continue supporting Iranian people .History is requesting from you to do so when the coup d, etat regime of Khamenei-Ahmadinejad for silencing everyone totally shut down the reporting from Iran. The Newsweek reporter and several reformist politicians will go on trial on the charges of acting against national security! Saleh Nikbakht a defence lawyer of the Ministry of Justice said that; his cliets journalist Maziar Bahari the Newsweek reporter and several reformists leaders will be going on trial for acting against national security. Mr. Nikbakht is also the lawyer of Mr. Abtahi deputy of former president Khatami in liaison with parliament , Mr. Safaei Farahani former Finance Minister , Mr. Abdolah Ramazanzadeh the spoksperson of Khatami Government and Mr. Behzad Nabavi the former Heavy industrial Minister and leader of the "Organization of Mojahedin for Islamic Revolution" . These prominent reform /change personalities were arrested during the last two weeks of unrest in Iran together with thousands of others.Mr. Nikbakht said ; he doesn't know when the trial will be held. "Martial law Government" is scared to death from another mass civil rights uprising! 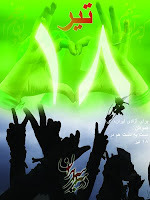 This is a poster about the 10th anniversary of "18th of Tir" ( July 9, 1999 students uprising in Iran) . 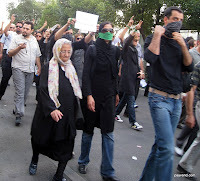 One report indicate that; on July 9 , 2009 on the 10th anniversary of students uprising a mass demonstration will take place at 5 places in Tehran against the coup d,etat regime. "18th of Tir" (July 9,1999),students uprising-pictures from those 6 days of uprising- several students killed and many arrested.